In a world that’s witnessed its lands be ravaged by magic and war, the small, mundane village of Adam lies in tranquility. But, as an imminent darkness threatens to disrupt the peace once more, Kellan, our protagonist, decides to abandon his humdrum life in Adam and pursue the secrets that lie behind the ghostly visage of his father and an ancient tome. Shadows of Adam is an ode to the classics—a trip back to the times when you played Final Fantasy VI on the SNES. It illustrates a journey of epic proportions and emotional strife that feels almost like a personal reflection of what the developers went through to get this game to its release. With humble beginnings on a Kickstarter campaign, the team endured trials and tribulations to forge their burning passions and souls into the refined product you see here today. Within the first couple of hours, I became firmly enticed; I felt a genuine sentiment for the genre that inspired the game’s development. To me, this title is a powerful reminder of the glory of the bygone era of old-school JRPGs. As you traverse an expansive world, you’ll find that the lore goes deep, beckoning you to learn more. Every piece of dialogue is not only a means of exploring the context of this tale, but provides flavorful text to heighten a sense of adventure. Though, what I especially appreciate, is the pacing. Not too much time is spent in any area, preserving the momentum of the story, and keeping the player interested. At the start of the game, you are pretty much dumped right into the action, only for the plot to gradually fill in later. With every minute, you’re trekking across multiple diverse environments to meet new characters and delve further into a labyrinth of histories and mysteries: a grand war with beings called Wraiths, the disappearance of the great hero Orazio, and much more. While world-building is critical, populating that world with characters that feel alive is what completes a story. Shadows of Adam follows the journey of four main characters, each of whom is noticeably distinct and elaborate. Giving characterization to voiceless pixel sprites is not an easy task, but this game executes it well with meaningful dialogue and complex backstories. Each character is fleshed out with personalities and quirks that bring both empathy and humor to the table. And the way they interact and banter with each other just feels authentic and gives a sense of light heartedness to serious themes. The combat adopts the turn-based battle system that is a staple of the genre, except it puts a new and exciting spin on it. Instead of normally having mana as a skill resource, each of your characters will have an Ability Points (AP) bar that regenerates via killing enemies or channeling abilities. This system is intuitive because it makes battles a lot more faced paced while allowing the player to utilize skills to their full potential; the standard ‘attack’ option spam is no longer the paradigm. 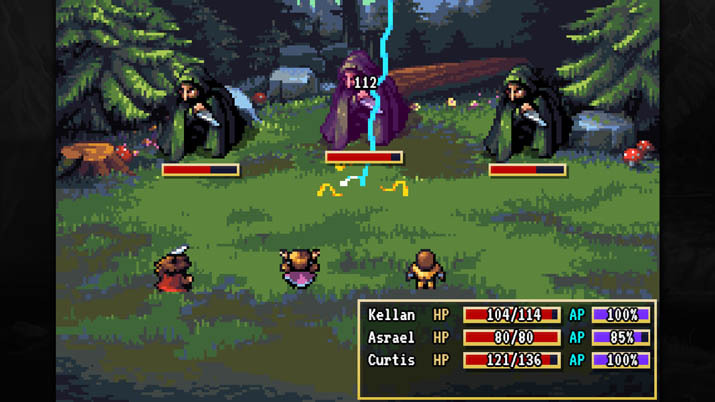 Among your adventuring party, you’ll recognize four of the signature classic JRPG classes: the warrior as Kellan, the mage as Asrael, the monk as Curtis, and the rogue as Talon. As you accumulate experience and level up, your members will gain a fair multitude of spells and abilities that may confine them to a role, yet they will still be versatile enough to allow a variety of play styles. From the start of your journey, you’ll notice that enemy battles are pre-staged, visibly represented on the level according to the sprite of the monster you will be facing; this ditches the commonplace mechanic of random encounters. While this has evidently been done before, I have to state my bias for this system: sudden battles are often annoying and punishing, while visible encounters allow the player plan and strategize. This system also integrates smoothly with the game’s excellent and concise level design, where every path is purposeful. There are also many optional hidden routes that contain opportunities for exclusive, high-tier gear; it’s great when a title rewards you for discovering secrets. In addition to solid game design and plot, the audio and visual aspects are on par. The soundtrack consists of a large variety of battle, character, and area themes that set an immersive ambiance. 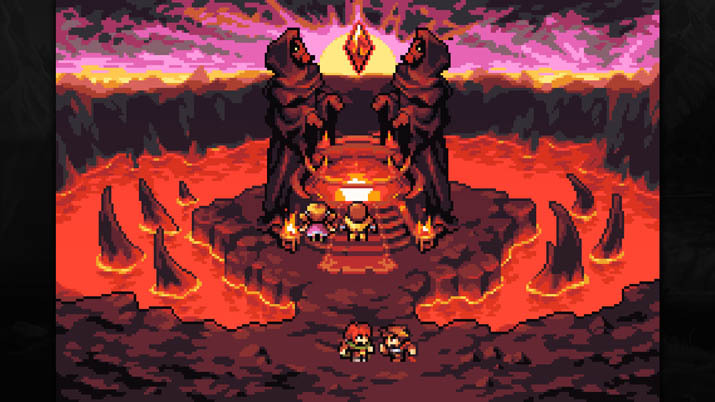 Each track is a well-crafted throwback to a classic, and the boss battle tunes are simply thrilling; each time you encounter a boss, expect some intense, upbeat music to liven the experience. 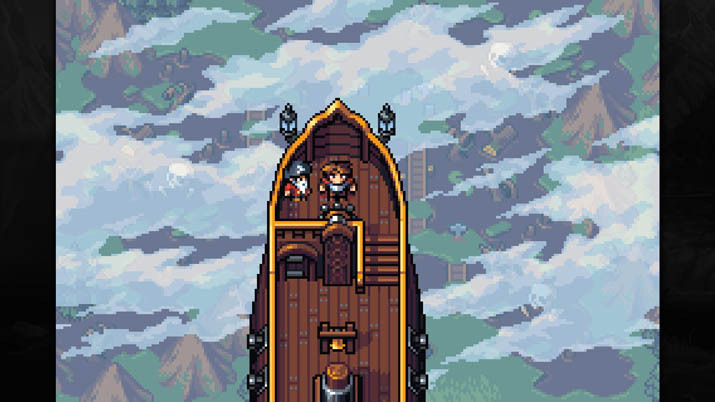 As for the visuals, the style is a retro pixel art, but rather than being evocative of previous notable works, it is a unique form that decides to portray classic JRPG in its own way. Every instance depicted in this elegant and detailed mosaic of pixels is also animated to bring life to the world. From the scattering of birds to the shifting waves of water, the environments feel vivid and dynamic. Shadows of Adam re-kindled a dissipating remembrance for old-school RPGs; it delivered, to me, an experience of the truest essence which I had not been subject to for the longest time. With an intricately crafted world, innovative and engaging battle system, and delightful array of scenery and music, this game is a splendid and true tribute to the SNES JRPG. While I did encounter a fair share of bugs, I was playing a beta version and am confident that they will be addressed in the final release. Nevertheless, any technical issues are overshadowed by pure awe and captivation—a relentless desire to play more and more.